Wreck-It Ralph has an interesting premise that will probably tickle gamers. It's amusing to see how gaming is spoofed. 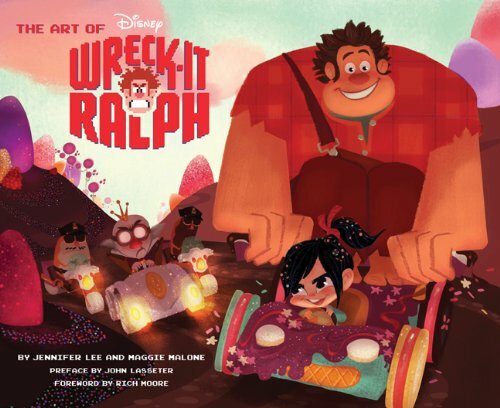 The book features the concept art, character designs, storyboards and colorscripts. There are lots of funny ideas and art. The book is split into roughly three parts that correspond to the game worlds that Ralph has to travel through. There's the 8-bit world, the First Person Shooter world, and finally the Sugar Rush world where the go-karts are racing. The first part looks at the 8-bit world as realised in 3D. The character designs are the cute big-head-short-legs type. I was looking out for game villains designs for the nostalgia but there aren't as many compared to the other characters. The FPS world is a strong juxtaposition from the two other worlds. The concept art here looks like they can for Halo, Mass Effect, or Gears of War. There are background art, vehicles and the technology. The only giveaway is the more caricatured character faces, cute cy-bugs and Ralph's armoured suit showing his big belly. The last part featuring the Sugar Rush world will get you into a sugar high just from looking at the pictures. There are landscape paintings of chocolate and candy, fluffy candy floss clouds, house of cakes, candy go-karts, biscuit soldiers and donut cops. There are even photos of the staff making models out of real confectionery. I feel unhealthy already after looking at so much sugar. The contrasting worlds and their quirky game characters makes this a wonderful artbook. Nice! I think i will ask it for christmas, its perfect in my artbook collection. I have NO artbook at the time, but I would like to start collecting! I am a 3D student..
What books would you recommend? I hard, "Cloudy with a chance of meatballs" is very good.. What other books (3D, Pixar etc) are really useful to learn? I'm also collection the books and i have 3 books now, if you are a student i think the art of toy story 3 is really intresting, also the art of Brave is really intresting. I would suggest the books from 3D Total. Hey great review. Liked the added book shot! I wanted to but this book and wasn't sure if its worth it. But with your helpful review I made up my mind. Thanks!